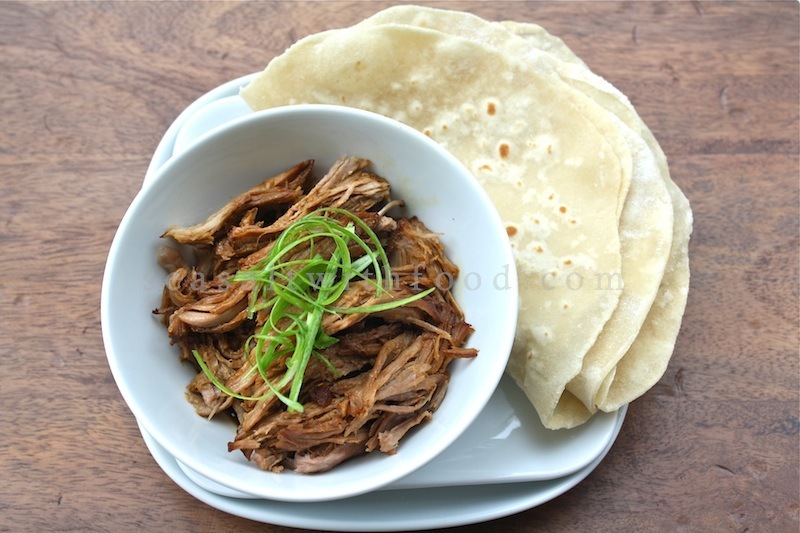 I did this Braised Pork Shoulder in a slow cooker for about 7 hours! The result was fabulous, the meat was fork tender and delicious. I served it with some homemade Mandarin Pancakes, topped with cucumbers, scallions, chilies, and some sweet and fragrant sauce. The wonderful sauce was derived from the residual liquid from the braised pork, which had to be reduced for another 40 minutes. 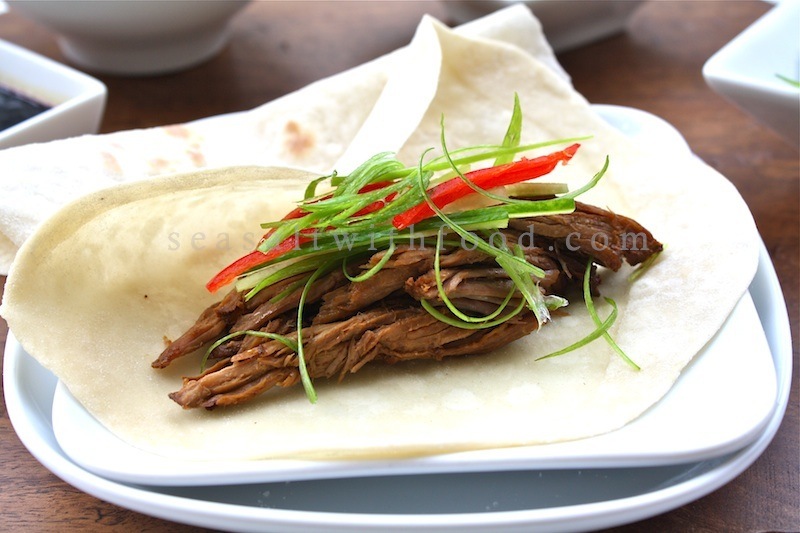 I have included the Mandarin pancakes recipe here too. Try it and enjoy! Combine all the ingredients in a slow cooker. Set the timer for 6 or 8 hours on high. Braise the pork in the slow cooker until the meat is very tender and easily falls off when prodded with a fork. Transfer the meat to a platter, and then pull the meat with a fork. Add a little sauce to the meat. Reserve the remaining sauce and transfer into a saucepan. Bring the sauce to a boil and reduce the heat. Let simmer for about 40 minutes or until the sauce has thickened. Make the pastry: Combine the flour and salt in a large mixing bowl and make a well in the center. Bring the water to the boil, remove it from the heat to let is stop bubbling and then pour it on to the flour. Mix quickly with the handle of a wooden spoon and add the oil. When the mixture is cool enough to handle, transfer it to a work surface and knead to a smooth dough. Cover with a damp towel and set aside for 30 minutes. Make the Mandarin Pancakes: Working on a lightly floured surface, break the dough into 3 pieces. Roll each one out into a long cylinder, and then cut each cylinder into 8 pieces. Roll each piece into a ball and flatten them into a disc with the palm of your hand. Dip one disc with sesame oil and put another disc on top. Using a rolling pin, roll the flattened pair of disc into a circle about 6 inches in diameter. Heat a cast iron pan or frying pan over high heat, and then reduce the heat to low and place the prepared pancakes. Once the brown spots appear on the underside, turn over and cook the second side. When the pancake is cooked, lift the pancake out and carefully peel them apart. Cover the pancake with a damp towel and set aside. Steam the pancakes on moderate heat for 10 minute. Serve warm. 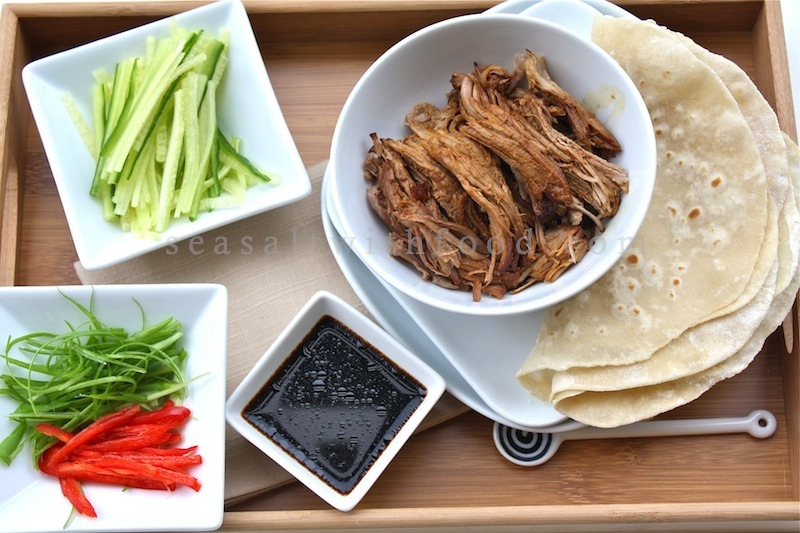 To serve, place some meat in the center of a pancake, add a few strips of cucumbers, scallions, and chilies and spoon some sauce on top and roll up the pancake. Serve immediately. That is absolutely delicious. What a wonderful recipe. Thank you for sharing. Delicious, what time should I be over? ;) Also, love your photography. Congrats on making Foodbuzz Top 9! FANTASTIC RECIPE, THANK YOU!! This was the hit of the party, everyone made their own pancakes, and I added several filler ingredients to you list.